Make the most of your advertising space by utilizing a canvas previously not considered – the floor! With carpet graphics, you can keep your campaign fresh in the eyes of your target market, and Ultraflex Systems, Inc. has all of the floor graphics products you need to expand your marketing and propel your brand to new heights. Ultraflex Systems, Inc. offers one of the most durable, top-performing carpet graphics products on the market – UltraCarpet® Extra. A white, tufted-pile carpet made specifically for solvent, eco-solvent, UV, screen, and Latex printing, UltraCarpet® Extra offers minimal drying time and produces durable, time-tested ink graphics that will not scratch off after prolonged use. While ideal for indoor use, this product can be used outdoors for short periods of time under normal weather conditions and is available in widths from 71” – 196”. View the Tech Sheet now for complete product specifications. 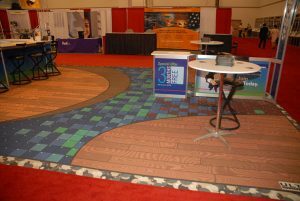 In addition to providing you with top-quality, printable carpet media, Ultraflex Systems, Inc. also offers FloorFlex® Digital, which is a printable floor vinyl substitute for UV and Latex printing applications. Simply apply double-sided carpet tape to your finished product and place your brand message right where your target audience is walking. Available face out on 78” and 126” wide rolls, FloorFlex® Digital is the vinyl flooring substitute that lets you promote your brand nearly anywhere. Learn more by viewing the Tech Sheet now for complete product details. If you are looking for carpet graphics or other floor graphics media and are currently in the USA, England, Scotland, Mexico, Canada, or elsewhere worldwide, we can help. Contact us today for more information, product recommendations, product samples, or any other questions you might have about any of our top-quality products and services. We look forward to working with you!